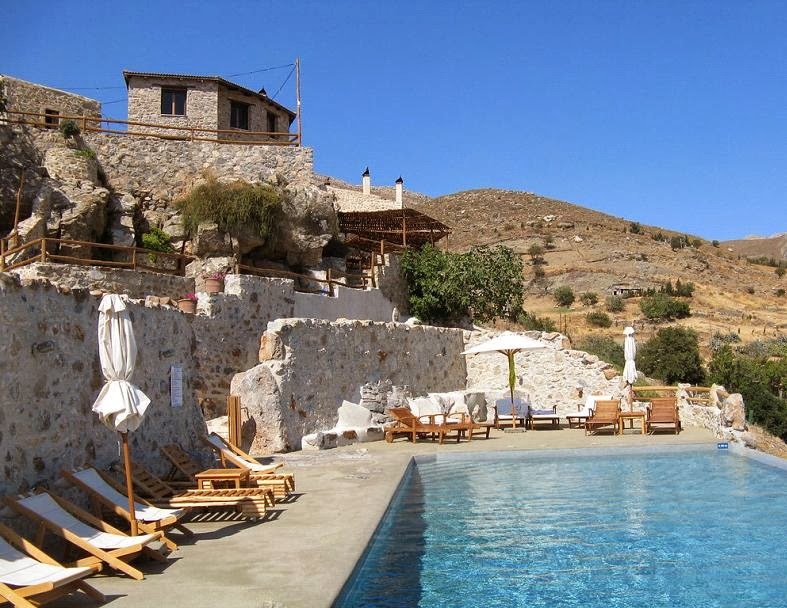 This 6 night/7 day food and wine and cooking holiday is not only a uniquecooking experience, but a chance to completely immerse you in the cultureof Crete. Tour around the island, visit cultural sites and local producersand learn to cook authentic and delicious Cretan dishes Our Holidaysallow you to steep yourself in Cretan local history, taste and cook usingthe techniques of Cretan mothers, grand mothers, house ladies, absorbsome of the most breathtakingly beautiful scenery that Crete has to offerand let the passion of the Cretan way of life take you to a whole newfood and wine haven. Please note that holidays are land part only and do not include flights. - How very few ingredients can be the basis for 6 or 7 dishes? Kapetaniana is a small village perched at an altitude of 800 meters on theAsteroussia range. This little known haven of tranquillity lies west of Kophinaspeak, commanding magnificent views over the Libyan sea and surroundedby mountain wilderness. Kapetaniana is the glorious setting where you willcombine your Cretan cooking holiday with an outstanding traditionalCretan cultural experience. This is why this Cretan cooking holiday is one of a kind. Your cookeryhosts offers an all-encompassing cultural cookery experience. In themornings you will sit down to a lavish breakfast before heading off tovisit sites of cultural interest specifically chosen so that you can immerseyourself in local Cretan history and tradition. The area is steeped in history and intrigue and you will visit many interestingplaces, including the Basilica of St. Titus, the valley of Messaras, the city ofRethymnon and the waters of Argyroupolis, and visit local wineries with achance to try your hand at making raki. Your host and cook, George, believes it is important for you to fullyexperience the Cretan passion for food and each day he will take youaround the island and show you the local traditions, historical andarchaeological sites of interest and then you will share lunch with thelocals before returning for your hands on, custom made cookery class. Under the careful guidance and tutelage of George, you will be taughtthe traditional Cretan way of creating and transforming simple dishesinto something wonderful to be shared with friends and loved ones. You will learn to cook in an informal and sociable environment, withlessons custom built around your tastes and preferences.The focus is on learning to be creative with traditional and localingredients taken fresh every day from the fields and markets.This really is the best of both worlds. A really unique experience,combining local visits in a beautiful tranquil setting with learningthe skills and passion of Cretan cuisine, this unique 6 night/7 dayCretan cooking holiday is truly a magical experience. - After lunch you’ll return to the Thalori houses and prepare for your secondcooking class with George this time focusing on stuffed peppers,courgettes, aubergines and tomatoes as well as Dolmadakia – stuffedwraps with vine leaves, sorrel and pumpkin flowers. - Spend some time at Matala and leave the place driving north for apleasant experience visiting a small family run winery producing specialsmall quantity good quality organic wines. The winemakers know theirproduct and share their knowledge. An exceptional experience a 'producervisit' visiting one of George's friends-cousin's farms for lunch. Picked allthe produce lettuce. This is a food, wine and cookery holiday that is about so much morethan simply learning to cook. It is a holiday that will awaken your senses,enliven your passion, invigorate your intellect and teach you how to cookmeals from the heart. With spectacular views over the Libyan sea, Kapetaniana is a cosy villageand the perfect location for your Cretan food, wine and cookeryholiday experience. This character location, in the heart of Asteroussia, has at its centre anancient building that has long been associated with myth and legend.It is now the unique and atmospheric location of your cookery school. You will cook and dine on traditional dishes chosen specifically from fresh,local ingredients that are in abundance around you, giving you that feelingof living from the land and letting you indulge in the beauty that natureprovides. The Asteroussia area is a favourite destination for anyone seeking thetranquillity of the mountains or breathtakingly beautiful walks along thesecret beaches of southern Crete. You will stay in the Thalori resort which has been designed and furnishedto offer memorable experiences. The Thalori is a complex of traditionalstone built houses which have been beautifully restored to reflect theancient traditions of the area. The houses are constructed from stoneand rock, with traditional fireplaces and embroidered carpets that createa gloriously warm atmosphere. The houses are equally functional and relaxing. There are 14 houses in total and these are allocated so that each personor group stay within their own house and share a bathroom.There is also a stunning swimming pool boasting beautiful viewsover the area. All meals and cookery classes are taken as a group hosted by cooks Georgewho is also your host for your tours around the island. It’s easy to see why host George is so successful in teaching cookery courses.He has a warm and friendly disposition, full of character with a great senseof humour. He has worked internationally in the hospitality industry for morethan forty years and has managed his own restaurants but he loves nothingmore than communicating his passion for the Cretan food and traditions.And for more than ten years now, he has been teaching others how deliciousand healthy traditional Cretan cooking is. George is a member of the Vegetarian Society International and is committedto raising awareness of the diversity and variety of traditional Cretan foodin vegetarian cooking and that it is not just a cuisine for meat eaters.